I've always thought the courgette is an underrated vegetable. I like the way it keeps it's firmness but can be soft in the middle. It's also incredibly good for you and according to 'The Kitchen Shrink', makes a great component for serotonin boosting food. The thing I love most about it, is how easy it is to grow in your own garden. I currently have six plants in grow bags on my patio that have so far given me a fantastic yield of both flowers and vegetables. Having watched Thomasina Mier's making a spicy vegetable soup the other evening, I now plan to make use of some of the young leaves too. So here are some super simple ideas for making the most of the courgette glut. And all the dishes can be made in 20 to 30 minutes too! Just a simple folded corn tortilla, filled with courgettes and edam (as I couldn't get any queso fundido or indeed the suggested substitute of Monterray Jack). Saute the sliced courgette with some seasoning and olive oil, just to cook slightly. Place tortilla in pan and fill half with the sliced courgette and a handful of grated edam. Fold the tortilla over, and cook both sides until lightly browned and cheese is melting. I served this with a simmered spicy tomato salsa (grill 1lb whole tomatoes, 8 jalapeno chillies and 4 cloves of garlic, until blackened, remove tomato and garlic skins - then blitz and simmer until reduced) but I think any chilli sauce accompaniment will lift this dish nicely, and a sprinkle of fresh coriander. Saute some finely chopped shallots (1 per person) or small white onion in olive oil, until soft. Add crushed garlic clove and season with salt and pepper. Add big splash of white wine and simmer vigorously. Turn down heat. Add grated courgette (about 2 per person), heat until slightly softened. Add creme fraiche, sprinkle of fresh lemon thyme (optional) & serve over freshly cooked pasta. Grate courgettes (about 1/2 lb) and squeeze out excess water. Whisk egg & add finely sliced spring onions or shallots, a little flour (use gram flour if you are gluten intolerant), salt, pepper and if to your taste, a little spice such as chopped fresh chilli, a teaspoon of cumin and fresh coriander. I also like adding crumbled feta to the mix if I fancy a chilli free dish (a rare but occasional event). The batter should be fairly loose. Shallow fry in batches until golden brown and serve with dollop of greek yoghurt. Slice courgette lengthways using potato peeler to get thin strips. Saute courgette strips in little olive oil until slightly softened, season. Leave to cool. Mix the courgettes with chopped flat leaf parsley and toasted sliced almonds. A lovely looking spicy soup made with sweetcorn, courgettes, flowers & leaves. Again, served with a spicy simmered tomato salsa. Yum! The August edition of Olive magazine has a tasty little recipe for courgette and taleggio frittata, which went down very well in our house. Simply saute the onion and garlic until softened, add the grated courgette, then the beaten and seasoned eggs, and the cheese. Serve with a big fresh salad. Another recipe from a previous edition of Olive, John Torode suggested stuffing the flowers with crab (if that's your bag) and or perhaps use goats cheese (if it's not). Courgettes are also one of my favourite ingredients to use in my Thai style noodle soup. Keep up the great website Jackie! I'm not even vegetarian but I love your recipes! The recipe is on my blog, if you fancy taking a look! 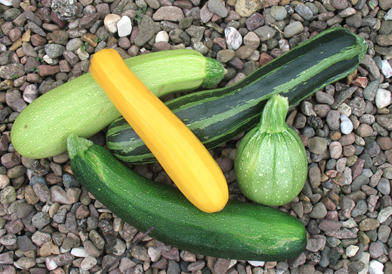 All hail the humble courgette! I agree, they're definitely underrated, and VERY tasty! Thanks for the recipe ideas. The flowers are delicious, too - I tried them deep fried on a trip to Italy earlier this year. Great to see a Manchester lass flying the veggie flag - well done, Jackie! Street food fanatic with a passion for travel, Asian food and vegetarianism. Currently residing in south Manchester with husband and 16 year old twins.